There are two main types of lizards around here: anoles and something else – little gecko looking things that are green, brown or black. I’m not exactly making peace with them but I am less alarmed than I used to be when I first got here. I prefer not to see them but there they are – hanging onto a window screen or running up and down the back wall of the house. The anoles are bigger, pale brown and have red sacks on their throats that they inflate pretty frequently. They also do a good amount of bobbing up and down which is fairly entertaining. This morning I was out early on the patio with my coffee and even at 7am, the a/c was whirring away. I saw a brown anole sort of prancing on the top of the unit. He moved to the edge, pranced again and then went in head first through the grill on the top. His tail was sticking straight up but at various heights as he moved up and down inside the shell of the machine. I don’t know what he was after but it must have been something good if he was that determined to get to it. And then a God-awful racket started and lasted for a surprisingly long time, much longer than you would expect it would take for a big fan to chop up a 5 inch long lizard. I actually gasped and put my hand over my mouth while the chopping was going on. So, I don’t know. maybe I do like them. Or maybe I was just taken with the unfairness of the man-made universe vs. a small creature. I heard that noise at least 20 times before it mercifully stopped. I don’t know. You wouldn’t think lizard parts would sound the same as a whole lizard as this event progressed, but this did. Maybe he was just bouncing around in there and ping-ponging from blade to blade as it rotated and then dropped down to the bottom, dizzy but whole. Both the death and the escape scenarios seem equally unlikely. When it was over, I poured myself a second cup of coffee. Am I The Only One That Didn’t Know This? Guess what? Florida is the lightning capitol of the U.S. And that article was published even before the cable box at the end of my driveway took a direct hit last week. #1 It took me a while to realize what happened, even though the exceedingly loud thunderclap did seem like it was right over my head and the ceiling fixture in the windowless laundry room where I was standing did seem have an instant of bright white light right before it popped. #2 It could have been worse – we only lost the cable tv boxes, an Amazon Fire Stick and the above-mentioned laundry room light bulb blew out. My work laptop -which was not plugged into a surge protector -got a little bit screwed up but not ruined. Anyway no internet, TV or phone for 3 days until the cable company got it all replaced. We had to talk to each other. The minor league baseball team in Jacksonville is called the Jumbo Shrimp. There seem to be a few logos for the team but my favorite one is the shrimp busting out of a stockpot of full of low country boil. 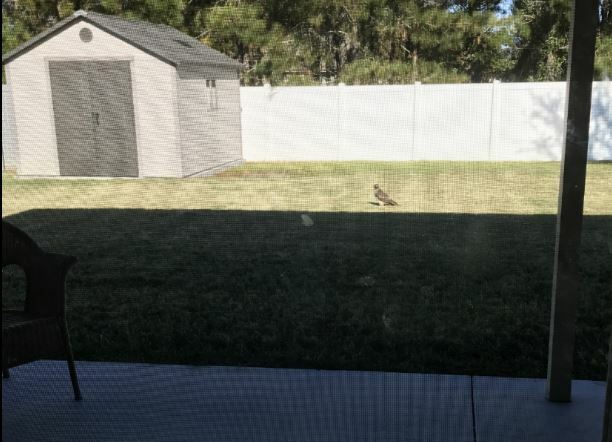 UPDATED: Look at this guy making himself at home in my backyard now. He’s got nerve a’plenty. The only thing left for him now has got to be knocking on my sliding door and asking if he can use my phone. Apparently, I’ve got my own hawk. The next door neighbor told me he hangs around in back of our fences and here he is. I took some pics from inside the house hoping not to scare him away but within a minute I slid open the door, stepped outside and slowly advanced towards him, one photo at a time and he never moved except to swivel his head around. Then I gave a test cough to see if he’d be alarmed and take off, but he wasn’t and he didn’t. 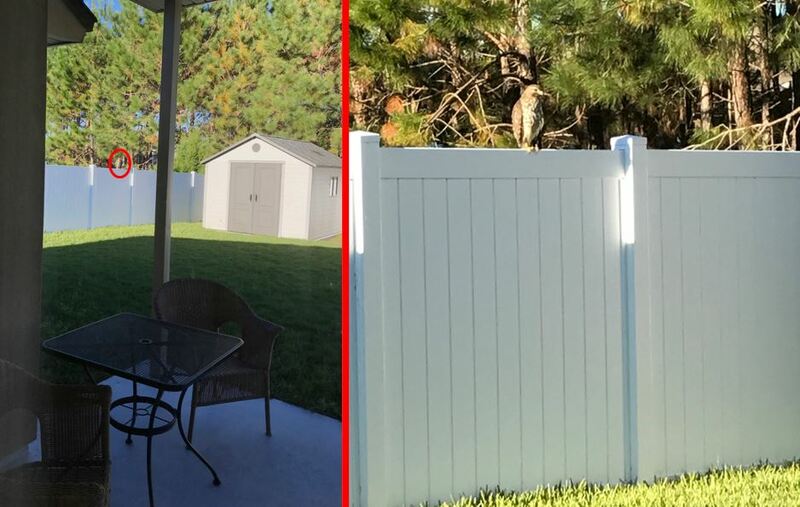 That’s a 6 foot tall fence or to put it another way, the fence is about 4 hawks high. I think I’ll wear a hat outside until I am safely enclosed by a pool cage. Maybe a helmet. I wonder if he’s strong enough to carry away an adult male corgi? Also, I saw what I assume was a baby heron strolling around the parking lot of World Market earlier today but I wasn’t quick enough to get a picture. It looked to be a perfectly formed heron but was only ~18″ tall. This is pretty good. In NJ, only pigeons and seagulls strolled through the parking lots. Update: I’m enjoying this photo of the setting sun shining on the pine trees that I took about an hour after the hawk picture. I didn’t enjoy it in person because I was pushing/dragging a lawn mover and a generator from the garage to the shed. I like the part where I’m down here alone and no one tells me what to do (or tries to tell me ha ha as if) but I do not like the part where I have to do my own lifting, carrying and pushing. Also, this wacky grass around here. We have that sideways crab-grassy stuff called St. Augustine Grass in the front but in the back, its mixed grasses. Whatever they are, they form a kind of surface mat on top. That stuff is about 6″ high now and I was worried I’d find the snake that the hawk was looking for. So I’m pretending the coloring here is autumn leaves in NJ* and then I’m putting on flip flops and cutting the sleeves off of my old jerseys so I can be more comfortable tomorrow when I move the giant air compressor around. *where by the way, a light dusting of snow fell this morning. Neither snow nor heat shall deter this corgi from his appointed rounds.